It's called the Phantom Express or XS-1. 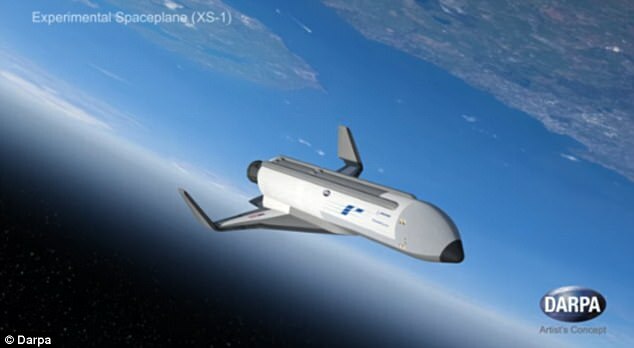 A space plane that launches satellites at a minute's notice. The US Defense Department's Advanced Research Projects Agency - DARPA - is spearheading the concept. Boeing is building it for test flights in 2020. The Phantom Express flies at hypersonic speeds up to Mach 10 or 7,600 miles per hour. It climbs to an altitude of 12,250 kilometers (7,611 miles) and higher. It's an experimental space plane/booster. The vehicle does vertical takeoffs and horizontal landings. DARPA designed it to launch small satellites for the US military. XS-1 is unmanned, robotic and reusable. It's neither a traditional aircraft nor a conventional satellite launch system. It's a hybrid of both. DARPA's mission for XS-1 is to cut satellite launch costs by a factor of ten. Also, to greatly cut wait times between launches. Phantom Express has some hurdles to clear. Specifically meeting several key DARPA goals. The Agency wants one day turnarounds including 10 satellite launches in 10 days. It will undergo rigorous tests flights in about three years. Here's how it works. XS-1 is a two-part vehicle. The reusable space plane vehicle flies at hypersonic speed to suborbital altitudes. Then the plane deploys a disposable secondary rocket. The rocket separates from the vehicle and launches the satellites into orbit. DARPA wants the Phantom Express to do another satellite launch within hours of the first.